Edel Assanti is pleased to present Sorel Etrog: Doors open from the inside only. This will be the first solo exhibition in the UK of the celebrated Canadian artist (1933-2014), staged in collaboration with The Estate of Sorel Etrog. Through a selection of bronze sculptures, paintings and drawings accompanied by artist books and archive materials, the exhibition presents a survey of Etrog’s engagement with Existentialism at the peak of his career. Drawn primarily from the period between 1968 and 1975, the works focus on two motifs that remained consistent through much of Etrog’s oeuvre: links and hinges. These devices were frequently deployed in his “abstracted figurative” sculptures, paintings and drawings as a means of transforming the human body or landscape into a web of industrial forms appropriated from common hardware stores. The works’ joints, muscles and limbs – rendered as mechanical, functional apparatus – oscillate between a poetic expression of humanity’s interconnectivity and an anxiety about our place within an automated society. This tense duality, shared by many artists and intellectuals of Etrog’s generation, permeates throughout the exhibition. Although primarily known as a sculptor, Etrog’s interdisciplinary practice encompassed painting, poetry, dance choreography, film and theatre. The stature of his frequent collaborators across these media – Claude Aveline, Samuel Beckett, John Cage, Eugène Ionesco, Marshall McLuhan – is testament to his significance within this generation. Etrog’s formal territory is vast and varied: he was ostensibly influenced by many of the movements of his era, including Dada and Surrealism, as well as antiquity, Oceanic and African art, furnishing his work with a complex aesthetic and artistic vocabulary. Despite thematic consistency, each medium in which Etrog worked reveals a different side to his artistic ontology. Exhibited in series for the first time here, a selection of Etrog’s paintings from the period reveal the profundity of his relationship with European Surrealism, as human heads are anxiously depicted in varied stages of metamorphosis. The drawings explore the interplay of mechanical form and the human body, their playful tone giving way to sexual innuendo echoed in Etrog’s later sculptural work. Etrog’s personal relationships, writings and poetry reveal a timely preoccupation with the human condition that led him to form relationships with Beckett and Ionesco in particular. Initial meetings in 1969 in Paris led to collaborative publications, in which Etrog illustrated a literary work by each of the writers. Later, in celebration of Beckett’s 78th birthday in 1984, Etrog composed The Kite, a performance involving National Ballet of Canada soloist Gloria Luoma, from which an additional book was created. The three books play a supporting role in this exhibition, serving to contextualise the concerns that Etrog’s formal language expresses: a search for the essence of human nature, the cyclicality of existence, and the wonder and horror of technological progress. The title of the exhibition, a quotation from Etrog’s writings, proffers a Sartrean solution to existential crisis – a reckoning that begins from within, with our own radical freedom of choice and ultimate responsibility: Doors open from the inside only. 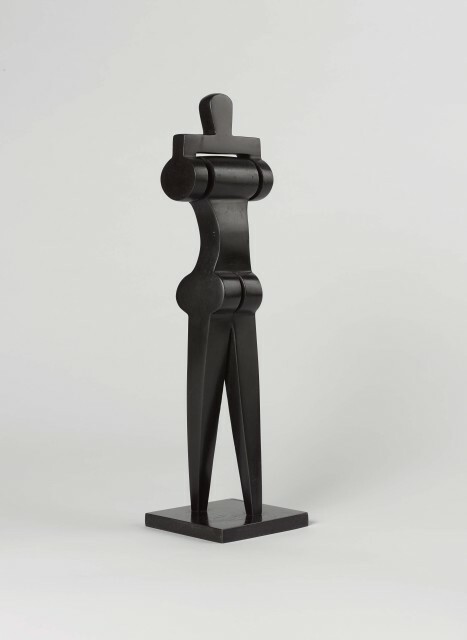 Sorel Etrog was born in 1933 in Jassy, Romania, where he studied painting between 1949-50. Etrog survived the Second World War, and emigrated to Israel with his family in 1950, studying at the Institute of Painting and Sculpture in Tel Aviv between 1953-55. During this period he joined an artist collective at Ein Hod, founded by Dadaist Marcel Janco. In 1958 Etrog was granted a scholarship to the Brooklyn Museum Art Institute. Etrog moved to Toronto in 1963, where he settled for the rest of his life, representing Canada at 1966 Venice Biennale. Etrog had more than 85 solo exhibitions in North America, Europe and Asia in his lifetime, and his work can be found in public collections across the world including the National Gallery of Canada, Solomon R. Guggenheim Museum (USA), Hirshhorn Museum and Sculpture Garden (USA), Israel Museum (Israel), Kunstmuseum Basel (Switzerland), Museum of Modern Art (USA), Seoul Museum of Modern Art (South Korea), and Tate Gallery (UK). His vast career was the subject of a major retrospective, 5 Decades, at the Art Gallery of Ontario in 2013, the year before his death at the age of eighty.